It’s common to like multiple aesthetics; part of you likes the modernity of a very edited home but you still have the itch to make your space feel cozy and comfortable. Luckily, there doesn’t have to be a choice between these two styles. The juxtaposition of classical décor with modern elements can create a sophisticated and warm atmosphere. Below are some helpful tips on how to achieve a transitional design concept. There are many ways to tweak the symmetry in a room while maintaining its sense of balance. For instance, in your entryway, use your modern console table as a center point, accompanied by two antique chairs on either side upholstered in a fun modern print. To add some variation, include a traditional table lamp on one side with a stack of your favorite design books on the other. Small differences to the symmetry like these can make the room feel less designed and more like they were put together over time. Choose a fresher color palette than the traditional warm golds and earth tones found in most traditional design schemes. Greys, pale blues and greens or fresh whites with pops of color when implemented on more classical furniture pieces creates an updated more transitional look. 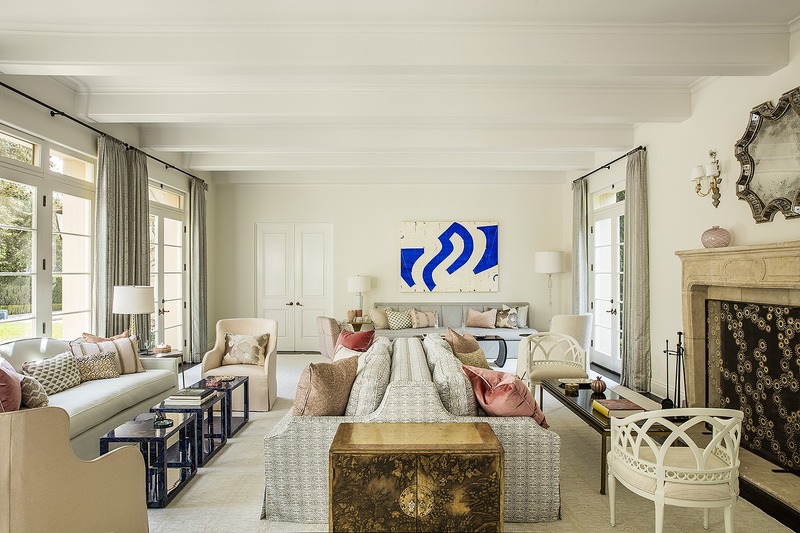 In a room with traditional furnishings, modernizing with art pieces is a great way to mix up the vibe. Utilizing contemporary works of art that complement your vintage pieces will create a lively and fresh feeling in an otherwise traditional room. The end result looks carefully curated while including the necessary pops of personality. To fully execute this transitional look, make sure to keep a harmonious mix of the styles. If the architecture of your home is traditional, brighten it up with a clean white paint for both the trim details and the walls. If you have a classical piece of furniture, update it with a fun modern printed fabric while retaining the original silhouette.